I just had my teen snap photos of my bum (for before and after comparison, of course). I have officially jumped on that squat bandwagon. 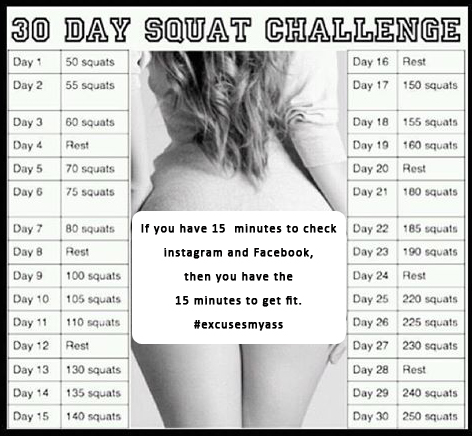 I am doing the 30 day squat challenge that everybody has seen on instagram, facebook and everywhere online. So, hopefully the photos of my rear will be motivation to get things in gear and continue the daily challenge. I’m actually looking forward to pushing myself and I suppose I’ll put some other challenges in the queue should this one prove to be successful. Hopefully I will get signed off tomorrow from my eye doctor and be able to start running again since he removed the possessed muppet that I had in my eye (post regarding that may or may not follow sometime). In other news, cucumber water has been delightful to quench my summer thirst and makes drinking eight glasses a breeze.